So unusual and so, so pretty. 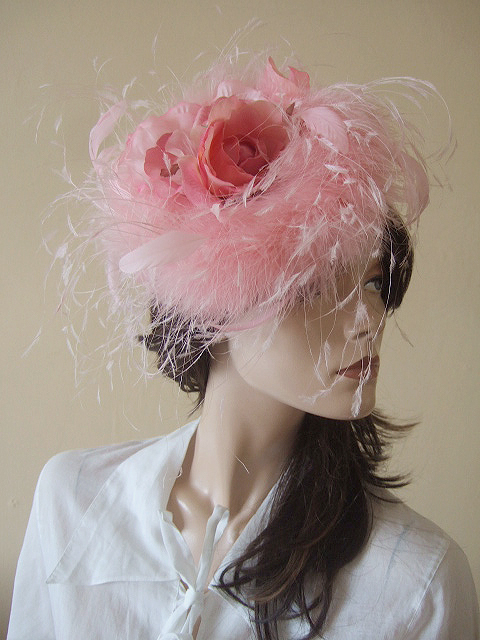 This is a Pink Felt Beret base headpiece from Grevi Firenze, sitting off centre and over the crown and right of your head. A pink silk rose in the centre, on a sea of long and short stripped ostrich hurl. A really cute headpiece for pretty summer outfits on all frames..
Attaches by a concealed elastic band that you wrap around back of head. Beret is 7.25" Front to Back.